I am trying to get into the Valentines Day spirit here. First there was this big fat cake on Monday. Tuesday I spent collecting stickers and doilies and ribbons for Pia’s school “Valentines Mailbox” (remember those?!) 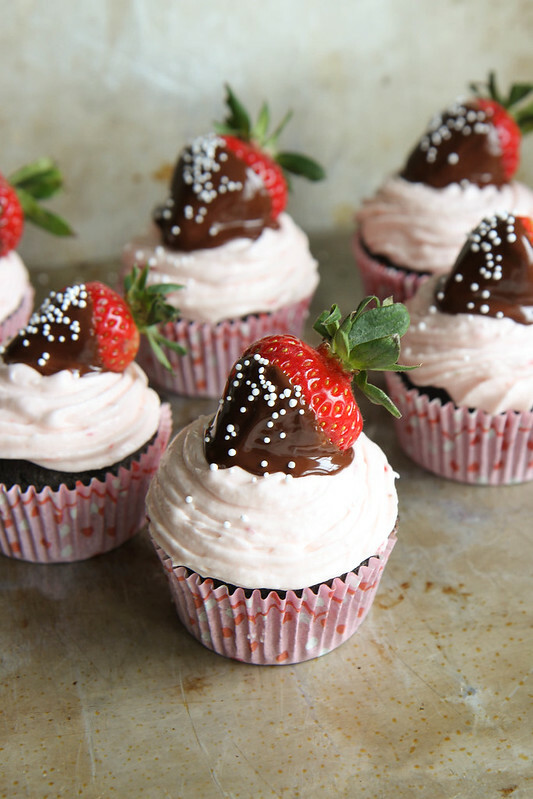 And now here are these totally indulgent Valentines Day-ish cupcakes. 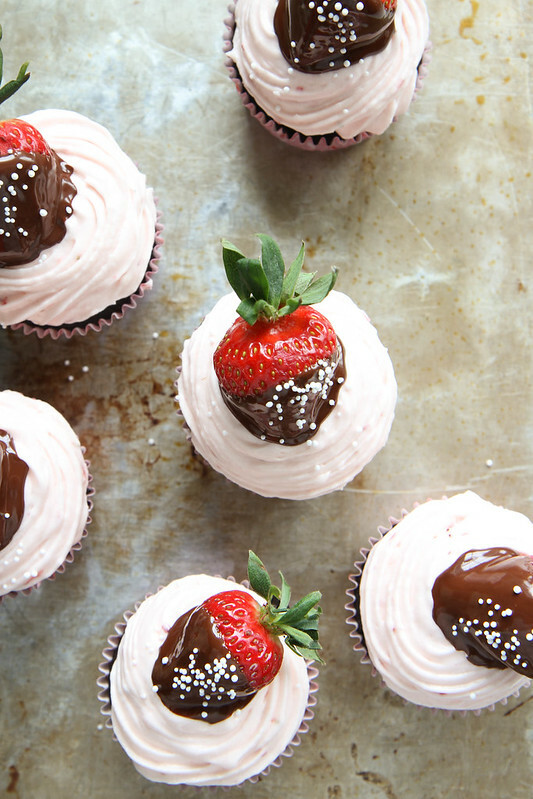 Super moist chocolate cupcakes topped with Strawberry cream cheese frosting and then the ultimate: A chocolate dipped strawberry. These have Valentines Day written all over them, right? I guess if I had used a little more fore-site, I may have drizzles them with white chocolate too- that would be very pretty- but sprinkles get the job done too with just a little added glitz! I have a few more Valentinesy sweets up my sleeve and then next week I am going to help out those of you who are planning to stay in and cook dinner next Friday. In the meantime, we are still swamped with Seahawks Fever around here. We got a free pass to take the kids out of school tomorrow to go to the big Superbowl Parade downtown. Pete said that he still remembers going to the Sonics Parade when he was 7 (that’s the last time Seattle had a championship!) and that the kids will remember this forever. SO- braving a quarter million people it is! (and it will be freezing). I think I have a few details to work out…. In a small heatproof bowl, whisk the boiling water and the cocoa powder together until smooth and then set it aside to cool. Preheat the oven to 350 degrees. Fill the cupcake tins with paper liners. In the bowl of a standing mixer, whip together the butter and the sugar. When it’s completely combined, add the eggs and whip until fluffy. In a separate bowl, combine the flour, salt, baking powder and baking soda. Add the cooled liquid chocolate to the batter and then add the dry ingredients and whip together until you have a smooth batter. Evenly distribute the batter among the cupcake liners, filling them about 2/3rds full. Bake the cupcake sat 350 degrees about 15-17 minutes. Remove from the oven and set out to cool completely. In the bowl of a standing mixer, whip together the minced strawberries, soft cream cheese, soft butter, powdered sugar and a pinch of salt. Whip until the frosting is light and fluffy and the strawberries are well dispersed throughout the frosting and have tinted it pale pink. Melt the 4 ounces semi-sweet chocolate in a small heatproof bowl in the microwave until smooth. 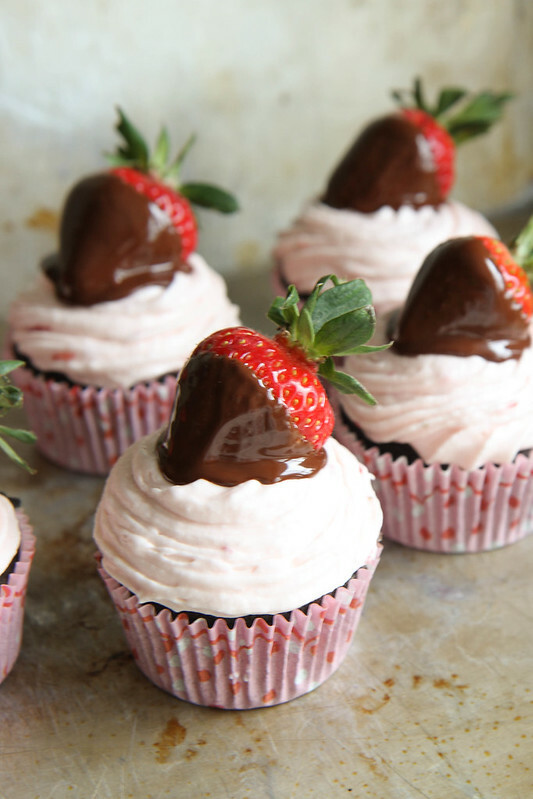 Dip the clean, dry strawberries in the melted chocolate, shake of the excess and gently place each strawberry on the top of one of the cupcakes. Add a few sprinkles to the top of the cupcake and strawberry if desired. Just beautiful, Heather! Looking forward to your other V-Day sweet treats. 🙂 Pinning! Valentine’s Day is so fun and I’m enjoying your love filled posts so much. Love that fresh strawberry frosting! These are beautiful beyond compare!!! I want to make these pretties asap. These are adorable! So pretty, fun and delicious! Perfect for Valentines day! These are such pretty cupcakes, love the strawberry toppers! The perfect cupcake for Valentine’s Day! Lovely!! Lordy Heather, these look amazing! I want, I want, I want! Thank you Amanda!! I have a few more romantic dishes up my sleeve!! I am in love with these cupcakes! These look beautiful Heather! And you are supermom for braving the weather for the parade. I would make my husband take them and stay at home drinking hot chocolate, lol. These cupcakes look wonderful! This is a great way to say Happy Valentine’s Day. 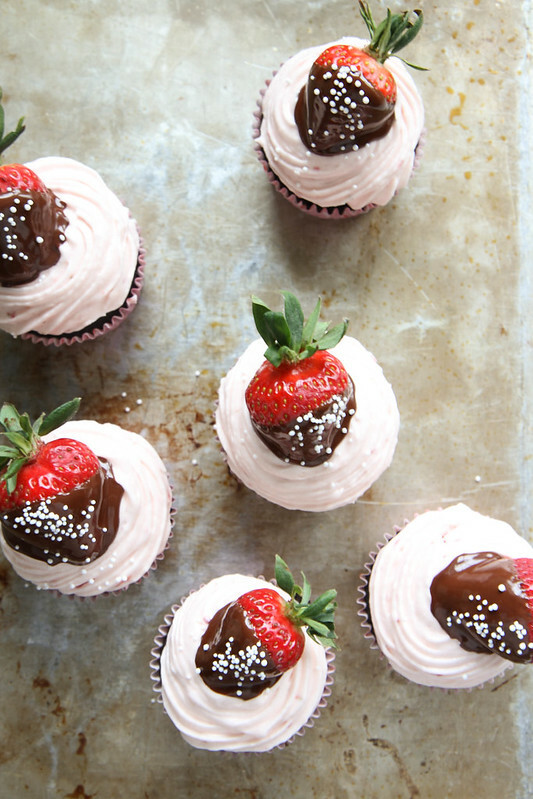 I love the chocolate dipped strawberry on strawberry cream cheese frosting…awesome! Thanks Jodee!The cream cheese added a little something so that they weren’t just cloyingly sweet! Oh these are some decadent Valentine’s Day treats!! How could I refuse to profess my undying love for these cupcakes!?! You’re right, these are no doubt the perfect Valentine’s Day treat. However, they should be everyday cupcakes because they just too delicious to whip up once a year. Fantastic job, Heather!! wonderful recipe.. I shall do these for the Upcoming National Cupcake Day November 24th, proceeds benefit our SPCA groups! I think 2.00 each is a fair charge! How fun Hilda!! Good Luck with your sale! What a fantastic recipe! Love the creativity 🙂 These are definitely perfect for valentines day! These are really pretty and look delish! Is there a hotel with a window view of the parade?!? What fun this will be for the girls. Gotta jump into the fever while it lasts. Very pretty cupcakes! I like that you changed it up because most chocolate covered strawberry cupcakes I’ve seen are strawberry cake with chocolate frosting. Oh mu goodness! These look wonderful. My granddaughter would love them. Thanks Nana- I bet they would, because my little girls went nuts for them! These are so adorable, Heather! Those are gorgeous. I would love a peek at Pia’s Valentine’s Day box. We have to make one for Louisa and I’m completely uninspired. Hope the parade was fun! These look SO delicious! An absolutely perfect Valentine’s Day treat!! These are absolutely delicious! My youngest son and I have wheat allergies, so I substituted gf all purpose flour blend and they turned out amazing! The whole family loved them! Awesome Kristin- check out my new series of kid friendly allergy free recipes on Sundays! These are perfect for Valentine’s Day! These do have Valentine’s written all over them! hi…do you use normal sugar or castor sugar ? I made your cupcakes last night and they are DELICIOUS!! I can’t get over how much I love the frosting. Thanks for sharing! Yay Courtney!! that is awesome- makes me very happy! If I make them the night before I need them should I put them in the refrigerator? Danielle- I think if you put them in the fridge that the cake will dry out. I would just put them in an airtight container. But I would put the strawberries in the fridge and top those in the morning once they have thawed (otherwise, coming up to room temp they will “run” all over the frosting. My 10 year old daughter just made these for a “cupcake wars” contest at our church. They turned out beautifully and delicious. She ended up winning her division! The chocolate cake part of the cupcakes were simply scrumptious and I can’t wait to try making that recipe into a decadent chocolate cake. We dipped the strawberries in chocolate and drizzled them with white cholocate to give the cupcake topper a very elegant look.